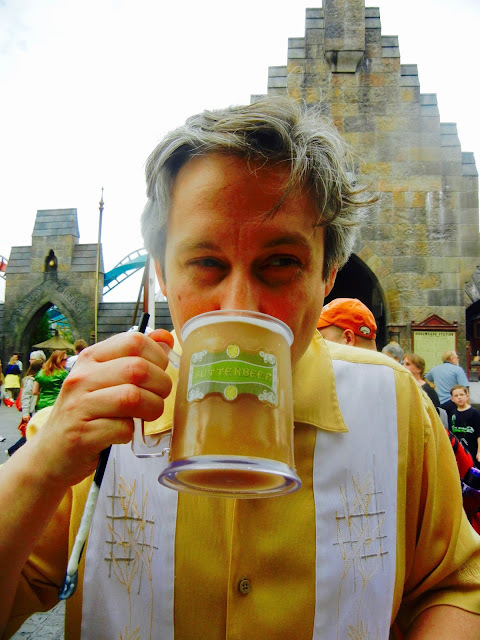 After our 2nd trip down to Orlando's Universal Studio's this year I came home dreaming of Butterbeer! So of course I had to make some at home. There are 2 versions at WWOHP - the regular and the frozen. I love them both! I made the regular butterbeer and also a grown up version (made with spiced rum!). Since I had some leftover I also made a frozen popsicle version. 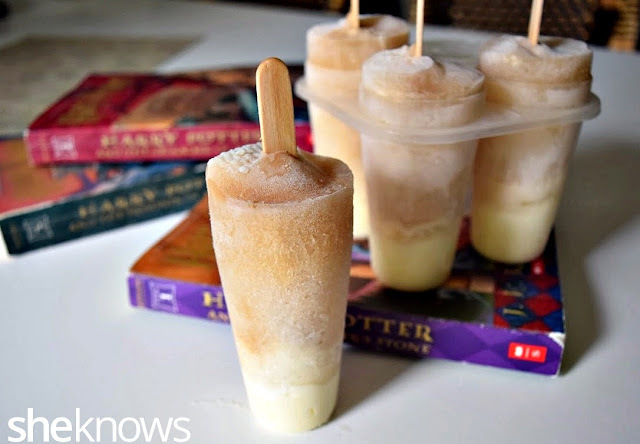 They should definitely add this to the menu at WWOHP! Awesome on a hot summer day. In case you haven't been able to make the trip to see Harry Potter land at Universal Studios here are some of my favorites from this trip. There are now 2 sides to the park. We had been to the Hogsmeade side before but now you can also take the Hogwarts Express over to the Diagon Alley . Me on Hogwarts Express enjoying a fine butter beer! The experience it pretty cool. They have some cool scenes from the movies as part of the experience so you feel like you are in one of the cars. They even have shadows that walk by and talk so it feels like Harry and crew are on the train. Diagon Alley - Super cool just to walk around with your mouth wide open in amazement or smiling ear to ear! Gringotts! The dragon breathes real fire randomly. And of course enjoying more than one butterbeer! As you can see the parents may have enjoyed WWOHP more than our kids but it's really so very awesome. My kiddo *finally* started reading the books a couple weeks ago so I can't wait to go back with him to experience it all again. 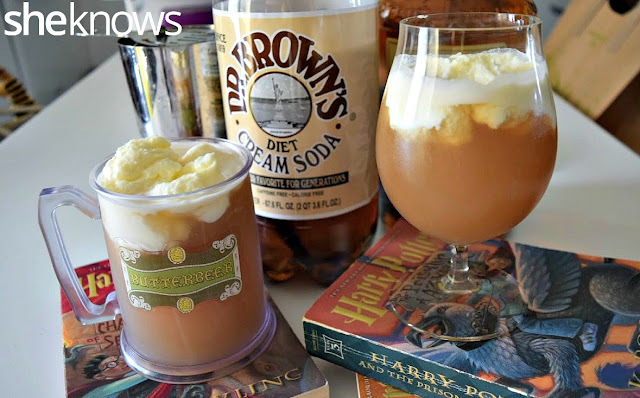 And if you like butterbeer too, check out the easy recipes here on sheknows! 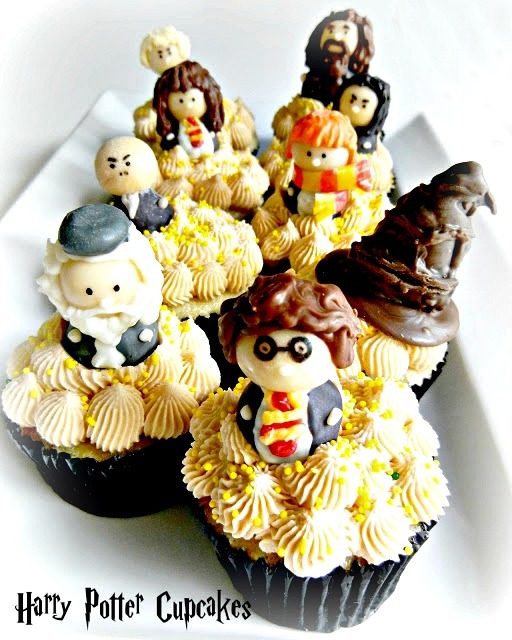 You may also like these Harry Potter Butter Beer Cupcakes!